Nine effects from the repertoire of Michael Skinner. Forward by John Carney is very informative. (John was one of Michael Skinner's dearest friends.) Michael gave John his "Notebook of Magic" before he passed. The introduction provides a "deep insight" into the career, life, friends, and "thinking" of this very special man. Michael Skinner is considered to be the greatest magician of all time. His sleights, subtleties, nuances, misdirection, patter, trick selection, and pace were impeccable...and the size of his repertoire was profound. Skinner could perform over 600 different effects at his prime - and perform them all perfectly. This e-book delves into the mind of Michael Skinner and gives complete descriptions of much of his favorite magic and provides the real secrets of how he thought, practiced, and performed - including the "intricacies" of his motivations. Skinner's insights, his "rules" of performance, and his choices of magic are what all magicians want to know. INVASION OF THE BODY SNATCHERS - Michael's brilliant "wild card" routine that is a superb study into how Skinner thought...every single aspect of this trick is explained...and learn a handling that most have never even thought of before. GIANT COIN - You will love this 4-part routine. It is a very funny routine and with a really cool sleight that is not only easy to do, but makes the outcome seem absolutely impossible...even to magicians. The end is so cool, and you end clean with a hilarious finale. Wait until you see this. MONA LISA CARD TRICK - This routine was one of Mike's favorite and most performed effects...learn an incredible subtlety that Michael pioneered to bring your final revelation to an impossible conclusion...it is superb. This routine is a "work of art"...and, learn an important lesson in "routining"! TORN & RESTORED PAPER - A very clever 4-stage routine that increases in amazement until the end...and simple to do. You're going to love this beautiful routine. THOUGHT PROJECTION PACK - Wait until you see this winner by Skinner. This routine is simplicity itself - yet you can read the minds of two different spectators...but the way Skinner "routines" this...is truly incredible. BUSINESS CARD PREDICTION - This is not Bill Simon's effect, but Skinner's ingenious, professional method that will fool any magician who does not know this effect. This is one of those effects that you will do over and over, for yourself in front of the mirror, because it looks so cool. FECHTER'S HANKY FORCE - Skinner loved this remarkable Force by Eddie Fechter...because it is very clean. Even magicians will be convinced that no force was involved. ALTMAN'S '7' LOCATION - Skinner also loved to perform this really cool trick...even when you know how it works...you will still fool yourself. It is brilliantly constructed. BONUS! - 'James's Miracle'! Stewart James was a favorite "study" of Michael Skinner because of his genius. This ESP effect is very interactive with your spectators, (a big plus!) and the spectators make all the decisions to arrive at an impossible final revelation. 1st edition 2017, 33 pages photoillustrated + 2 videos. 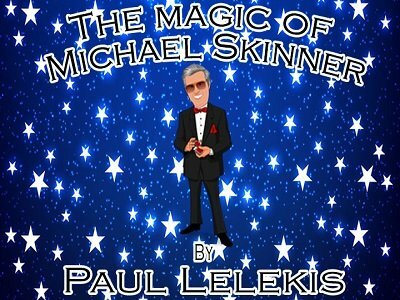 'Magic of Michael Skinner' MAY be my favorite of all the many ebooks by Paul Lelekis. I'm not ready to make the final call.. yet... but I'm certainly leaning that way. Why? Because I have a profound respect for the magic of Michael Skinner, and an equally profound respect for the writing of Paul Lelekis. There are nine effects.. and each is very different in method and culmination. Business Card Prediction, Thought Projection Pack, and James's Miracle are all distinctly mental magic with cards. Altman's '7' Location, Mona Lisa Card Trick, and Invasion of The Body Snatchers are all Skinner's handling of card effects that are both original and clever.. in a Michael Skinner way. And if you aren't familiar with Michael's magic, Paul has lead this ebook with a very interesting tretise on the life and magic of Mr. Skinner. In addition, Torn & Restored Paper, Giant Coin, and Fechter's Hanky Force are all very interesting effects and a force in and of themselves. Nothing is simple.. aside from the force, and nothing is overly complicated. Just wonderful magic theater from someone considered highly unique and gifted. The Magic of Michael Skinner by Paul Lelekis is a wealth of great advice and techniques from a true Master of our Times. This is Pauls' finest eBook of the year for sure! Handlings that are straight forward and convincing along with some exceptional presentational tips throughout. The foreword by John Carney and Introduction by Paul are easily worth the price of the book. Here you'll be presented with Michael Skinners philosophy on practice, discipline, creativity, ingenuity and naturalness of performance. This is a fantastic way for you to get acquainted with the presentational style and wonderful magic of Michael Skinner. The nine effects are all time tested routines that you will enjoy learning and performing. There’s a little something for everyone here. They are all geared to emphasize entertainment, presentation and the art of engaging your audience. Straight forward clean, non-complicated and direct routines. I particularly liked the opening effect "Invasion of the Body Snatchers" (one of my all-time favorite movies), the best patter/presentation, and interpretation for this classic effect I've ever seen. A solid winner for sure! The "Mona Lisa Card Trick" another favorite of mine is a perfect example of a short routine that has a great kick to it and you'll be having some fun with it in no time. Besides the card effects you’ll get a cool Giant Coin routine and a beautiful, clean, smooth handling of a Torn & Restored Paper routine that goes a step or two further than similar effects. All this plus an ingenious prediction Bonus effect from Stewart James makes Pauls' "The Magic of Michael Skinner" destined to be a top seller. Michael Skinner is a legendary name among close-up magicians. John Carney in his Foreword to this book respectfully delves into the psyche of this extraordinary professional performer. Skinner exemplified naturalness, deliberateness, neatness and exactness in his routining and moves. Throughout this book, the astute student of magic will be able to appreciate abject lessons in Pauses – that which precedes each revelation or transformation – and shifts the moment of each effect to a heightened level of dramatic and psychological impact. Paul Lelekis – certainly a fan of Michael Skinner – has written an exclusively, befitting, tribute to one of his major influences. Lelekis’s extensive breadth of performance experience and encyclopaedia of effects, successfully captures the Skinner Spirit – discovering perfection through disciplined practice, dedicated analyses, and a determined appreciation of the audience. He has compiled nine of Skinner’s effects that include a Wild Card routine, torn & restored paper, demonstration of ESP, busines card prediction, coin transformations, and preferred card force. Every nuance and subtlety is described through Lelekis’s thorough descriptions and video explanations of sleights. The legend lives on through the pages of this important book. May you carry on the legendary work in the Skinner tradition. Paul’s knowledge of magic is encyclopedic. Such a treat to see this tribute to arguably one of the best close-up magicians of all time. The introduction with stories about Michael are worth the price of this book to magic lovers. In addition, one receives pro-working, Skinner magical miracles. Paul’s writing style is clear & easy to follow plus one receives with the purchase some tutorial videos.